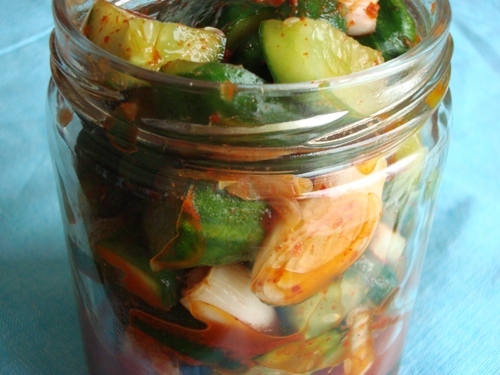 Updated on July 21, 2011: Please note: Cucumber kim chi is best refrigerated and enjoyed right after making it. You can allow it to ferment before refrigerating as you would with cabbage kim chi, but because cucumbers tend to go soft a lot quicker than cabbage, it's best to think of this dish as a crisp, refreshing salad/side dish. Enjoy! One of the joys of Korean cuisine is having a number of healthy and yummy side dishes to eat along with each main course. Kim chi - fermented, spicy cabbage - is easily the most celebrated Korean side dish. Few non-Koreans know that hundreds if not thousands of varieties of kim chi are made throughout Korea. Makes perfect sense, of course, since you can make kim chi out of most varieties of vegetables. 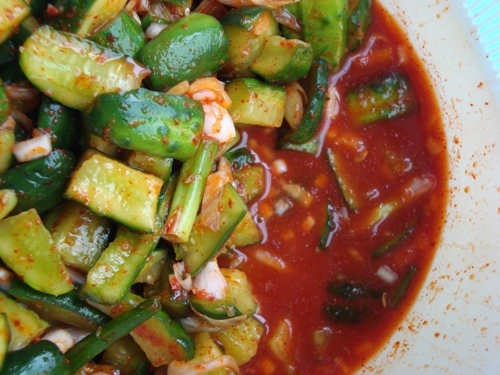 Why should you consider eating kim chi now and again? It's a tasty way to give your body a number of nutrients that come with raw vegetables, including those found in raw garlic. Combine raw garlic, plenty of enzymes, and a long list of antioxidants with the probiotics that come with naturally fermented kim chi, and you have yourself a true superfood that provides a powerful strengthening effect on your immune system. 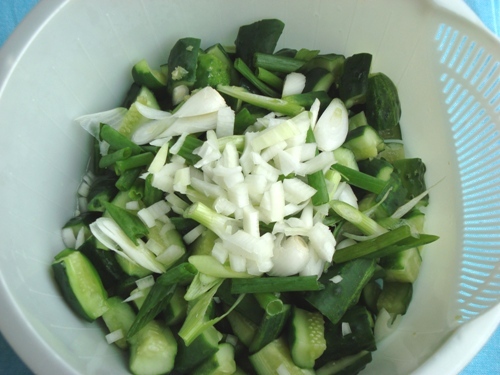 Start with about 15 to 20 small cucumbers, the kind that are used to make dill pickles. If you can't find small cucumbers, you can use about the equivalent amount of large cucumbers. 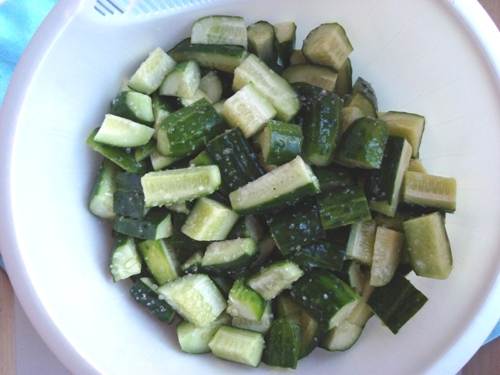 Give the cucumbers a good rinse, then chop them into bite-size pieces. Put them in a large bowl, add about two flat tablespoons of sea salt, and toss well. Allow salted pickles to sit overnight at room temperature, or at least for a couple of hours. 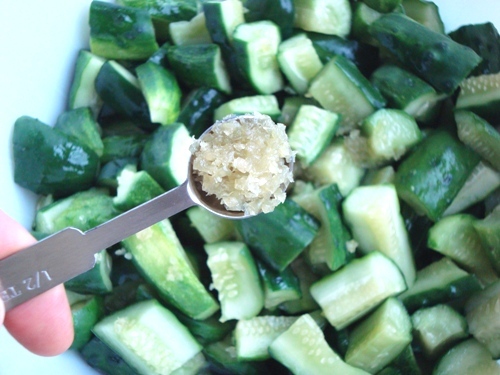 The salt helps draw moisture out of the cucumbers, which creates a natural brine. Now add 1/2 to 1 full teaspoon of minced raw garlic. We use raw minced garlic that we keep in a small container in the refrigerator. 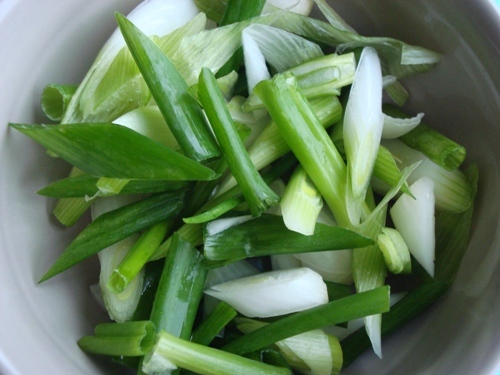 Wash and chop up three green onions - not three bunches, but three individual ribs. Not sure if they are called ribs? Cords? Hope this is clear. Add chopped green onions to the mix. Don't you love seeing all this green? 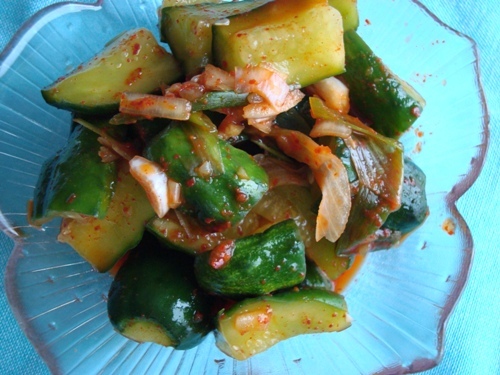 The green onions add texture and natural sweetness to this cucumber kim chi dish. 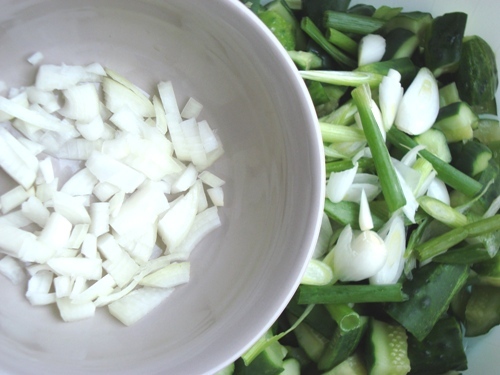 For a little extra sweetness, chop up 1/4 of a small to medium yellow onion. And add it to the mix. If you're worried about the sharp bite that raw onions have, stop worrying right now. Once given a day or two to naturally ferment, the onion loses most of its sharpness. But it doesn't lose any of its flavor, so unless you really have something against onions, go ahead and add some. Now the part that makes any kim chi a real, authentic kim chi: add two flat tablespoons of fine red chili flakes. I don't know whether to call this red chili flakes or powder. It's not really a powder...the flakes are really fine. Koreans call it ko choo kah rhoo, which literally means ground hot peppers. If at all possible, please get some of this stuff from a local Korean grocery store so that you can be sure that you have the right kind for making kim chi. 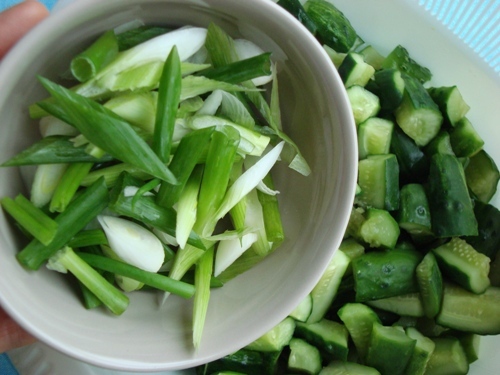 You can add ko choo kah rhoo to any number of dishes, of course, like miso soup and seasoned green beans. Koreans add ko choo kah rhoo to just about everything. Did I mention that ko choo kah rhoo is extremely rich in vitamin C? Now add a teaspoon of vinegar. Oops, forgot to add a little extra hint of sweetness. Just a tablespoon of honey will do, please. You can actually add the honey before the first good toss...we just forgot. 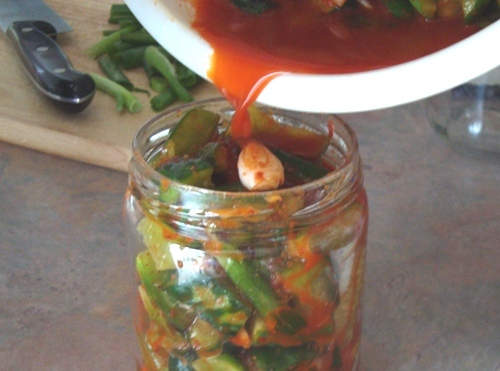 Here's a good look at the glorious kim chi brine that is naturally created as you go through the steps in this recipe. Once the kim chi cools down in the refrigerator, this brine is a real treat on hot days. Just one spoonful after a meal makes you feel like everything is going to be okay. Now pack your cucumber kim chi away into glass bottles, and don't forget to add a bit of brine to each one - just a couple of tablespoons of brine per bottle will do. Here's a close-up just before we cap it and put this baby to rest for a day or two. All that's left to do at this point is to transfer the bottles to your refrigerator and enjoy small servings as you please. 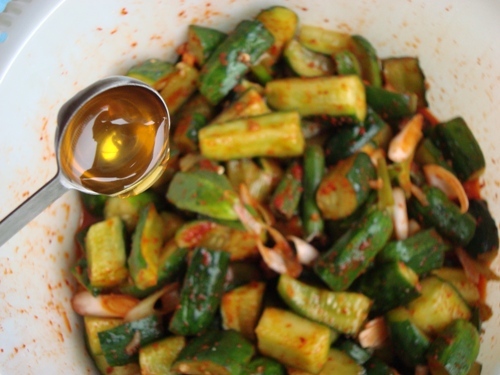 Cucumber kim chi doesn't typically keep as well as cabbage kim chi, so you can begin enjoying it right away, almost like a crisp, refreshing salad or side dish. It's best to eat up your batch within two to three days, though if kept refrigerated, it will keep for quite a bit longer, although it will lose its crunch by the day. 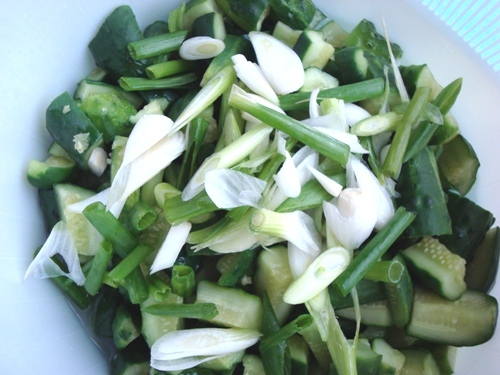 Update on June 10, 2010: If you enjoy Bok Choy, use clean Bok Choy leaves instead of cucumber in this recipe to create mouthwatering Bok Choy kim chi. I have to admit that at first glance, the name of this nice side dish turned me off a bit. After reading through the article on how to make it and seeing the finished product I REALLY want to try it :) It looks tasty! I am kind of nervous because I just followed all the directions to a T, but it is super salty >.< hopefully it will be better after 24hrs fermentation?.. Did you use table salt? I know this is probably really old but I think I might have the answer. If you used regular old table salt, this will definitely be too salty! I use kosher salt (see my blog http://kimchi-story.blogspot.com/...very similar to this recipe) and it works out just fine. Mine also very salty. Was hoping after fermentation taste better. salt in the amount the recipe calls for. Sea salt isn't more salty, but because kosher salt is larger chunks, if you use the same volume of a finer grained sea salt, you're actually using more salt. It's the problem with measuring by volume (instead of weight). I've been receiving your delightful newsletters for a few months and this is my first time to post. I want to thank you and your Mother for these recipes with such outstanding photography. I'm so anxious to try this, and your directions make it sound simple. We live in PA and I make raw sauerkraut which my husband and I enjoy, and it's also available at many growers' markets during autumn. We generally have a little before our evening meal now and then. Those tasty little cucumbers are available now so this will be a nice change for us. One thing I'm wondering about; I have chili powder but it's not so hot that it requires gloves, so I'm wondering if I need a different type or if you are referring to cayenne red pepper. If so, that may be a bit hotter than we'd like. I'll be looking forward to more recipes. Thanks so much for taking time to offer such nice information. [img_assist|nid=1301|title=|desc=|link=none|align=right|width=112|height=168]Regarding the chili powder, I don't believe that the Korean variety is the same as cayenne pepper. Koreans take red chili peppers that look like the peppers in this photo, and I believe they sun-dry them and then grind them into fine flakes. They're more flakes than they are particles of a powder. If at all possible, I recommend that you try to get some <em>ko choo kah rhoo</em> at a Korean grocery store. They're usually labeled as "red pepper powder." You can use just a small amount at first and add more if you like a little extra heat. The amount that we've suggested here creates a mild spicy flavor. Thanks so much for posting this! This is one of my favorite Korean side dishes. As far as the chili flakes go, the Korean ko choo kah rhoo is not as spicy as the cayenne. I just learned this. I tried making some kim chi jjigae using cayenne and oh my goodness was it hot!! I think the Korean red pepper flakes are milder. Don't get me wrong, it's still spicy, just not as potent. Can't wait to make this!!! search 'kochugaru' or 'kochukaru' on amazon. Hi. Is chili flakes the same thing as cayenne pepper (ground up)? As you can see, I know less than nothing about spicy peppers. I can't wait to concoct some of this when the cukes in my garden are ready. Also, my garden has garlic, green onions & regular onions so this will really be a home-made food. Can't wait for more from the senior Mrs. Kim. Korean chili pepper is different from other chili peppers. Instead of powder, it is more like finely grounded flakes. Korean chili pepper is also more mild than normal chili pepper and has a slightly sweet taste. Well done and thanks for sharing this recipe. I love the way you share your recipes especially capturing and sharing the photos and in that way it's so easy for us to understand and follow the procedure. It is always very interesting to look at the pictures. Keep it up. I tasted a Korean kimchi but this time i will try using cayenne pepper for a change and see the difference. At least I know now how make kimchi. Thanks for sharing all the good articles and keeping us healthy. I just love how the recipes are photographed with step by step instructions. It helps to see just how a dish is supposed to look as you are preparing. Hope you continue to do this. I just wanted to say I've been getting your newsletter for years and love it. I have an adopted Korean son and when he came home to us I began a journey into Korean culture and cooking. What a delightful experience. I encourage everyone to go to their nearest Asian market and talk to the owner. They are usually more than helpful to explain about the different foods they sell and use. And, yes, the Asian chili flakes ARE different from the American version. But DO try some of the foods there. It is like going on an exotic trip without travelling the distance! I have also used a most wonderful cookbook for many years..."The Korean Kitchen" by Copeland Marks and Manjo Kim. If Peter Piper picked a peck of your spicy, pickled, cucumbers, he'd be perfectly peppy all day. This is a great raw recipe. Red peppers increase blood circulation to the brain. We could all use some of that! Hello, the Kim Chi looks fabulous! I would like to make this, from my soon-to-be-abundant cucumber crop, and give it away as gifts. Currently I am making cornichon (The little, super-sour, French pickles) out of them, but some variety would be nice too. the kimchi looks delicious. i want to make some today, but don't the cucumbers need to be completely covered in brine, or it will get moldy? that's what my mom told me. I also thought the cucumbers had to be totally covered in brine so I am a little bit scared to try this recipe. It looks so good though that maybe I will be a little adventurous. Actually, you want the good variety of bacteria that happens with fermentation - this, according to a number of studies, is incredibly important to our health - sort of feeds our body the way compost feeds the soil. 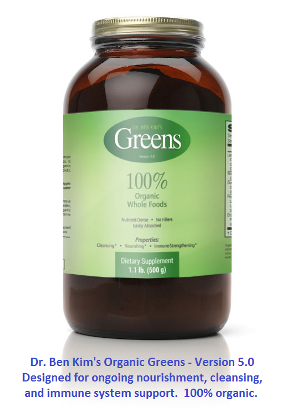 We normally have trillions of bacteria on and in our bodies, and they play an important part in breaking down nutrients in our intestines, as well as (maybe most importantly) competing with pathogenic and cancer-causing bacteria. We've thrown our systems off with antibiotics and an excessively sterile culture, but there are, as I understand it and now believe, great health benefits from good, aerobic bacteria contained in cultured or fermented foods like yogurt, kefir, kimchi, and raw sauerkraut. (You just layer chopped cabbage with salt and let it ferment). It takes some getting used to, I know, but my sense is that vegetables, as long as they start out clean and not contaminated with manure, will grow "good" bacteria as they ferment. I have never heard of a food-borne illness from kimchi, which I have kept in my fridge for years, sometimes, (when I forgot how much I loved it) and not completely covered in brine. 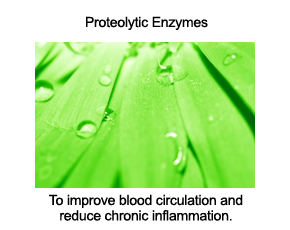 I think it sets up a very stable "ecosystem" of bacteria which is not only safe but very beneficial. I was lucky enough to live in Waegwan for a year while in the Army which is where I fell in love with KimChi and Yaki Mandu! The Old School Korean buries an earthenware jar(s) full of KimChi to last till the next spring. This stuff keeps forever! But it won't last that long once you get hooked! I am terrible at reading long intructions and strained the brine and tossed it out. Once I read the entire recipe I realized the mistake, is this ok or is there a way to make some brine by adding extra salt and a little water? Wow! Is this ever a great recipe. I make cabbage kim chi often but this is so great for summer. I have made it once and need to start another batch tomorrow. I have told many folks about it and will look for ko choo kah rhoo next time I am at an Asian Market. I work at a farm and use only the vegetables we grow. This recipe works just fine with larger cucumbers and even lemon cukes. Thank you for sharing. I didn't have the chili powder on hand but I do keep a tub of "kochujang" -Korean red chili paste. I substituted the chili powder in your recipe with the hot paste and it seemed to come out just fine. It took a little more time to work in the paste evenly than a powder I suppose. Tastewise, it'll probably be better tomorrow! Dr. Kim, I have been trying your recipes for some time and absolutely love them. Because of them I have now altered my personal description to be as follows: My skin is from Africa, my spirit is from Hawaii, and my stomach is definitely from Korea! I love that they are light, with lots of vegetables, have delicious spices and flavors, and are complimented with a side of fish (I'm mostly vegetarian, but I eat fish from time to time). Thanks so much and keep the recipes coming! Wow. Thank you so much for taking the time to explain this in detail and take such beautiful photos. I can't wait to try the recipe! Undoubtedly Koreans are #1 in fermenting everything. In northern European countries fermenting cabbage and cucumbers before refrigeration, was done in the fall for preserving for the whole winter. The salt and the cold in the basement kept things from getting mouldy. So will keep long in your fridge. Using ground hot papers powder it does not dress the vegetables and ends up in the brine on the bottom of the JAR (not bottle). Use any hot peper flakes but not crushed hot peppers as on pizza. 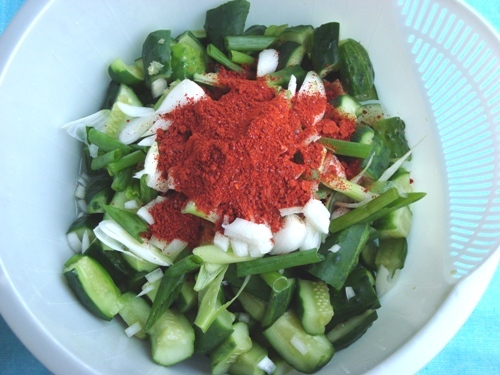 I lived in Korea for two years when I was in my late teens and early twenties and I ate cucumber kimchi (or as you would say in Korean oe kimchi) many, many times. I always thought it was too daunting to make but your step-by-step process complete with photos was great to see and very informative. I'm going to have to try it!!! This post brought back some good memories for me! When kimchi is really made with care, it's wonderful. This from a guy who would not touch it for the first 7 months of my time in Korea. But then I became addicted to it. I believe ko choo kah rhoo is cayenne pepper powder. One of the many things to consider here is the natural heat of the cayenne used. 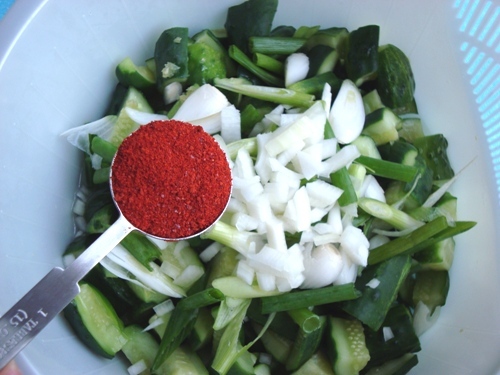 Most cayenne readily available at the local health food store or grocery store is 30,000 to 50,000 Scoville Heat Units. That is plenty hot for most people. Some cayenne pepper powder, though, can be as hot as 160,000. 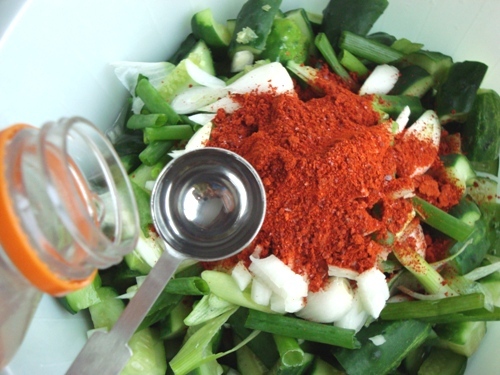 The heat in cayenne is caused by the capsaicin with the Scoville Heat Units -- SHU -- being the layman's way of interpreting the heat of the cayenne and other hot peppers. You are right in saying how beneficial ko choo kah rhoo is for you, though. It's very, very healthy. I lived in Korea for a 1 and a half and at that time used a lot of cayenne pepper or ko choo kah rhoo. I have been a huge kimchi fan since I was a child and was lucky enough to be introduced to several homemade varieties. This is a great recipe ! The pics are great as well. Thanks for sharing. Easy and Fun for kids! Thanks SO much for posting this. My 5 year old sat next to me and made his own while I made mine. At the end he said he didn't want pepper but he wanted his sauce to be red. I didn't know what to use for him. Then HE suggested Paprika! It actually tastes alright...and easier on a five year old tongue! I told him I'd pass on the substitution for other parents who may want to try it for their non-spicy kids :). Thank you for this wonderful recipe. 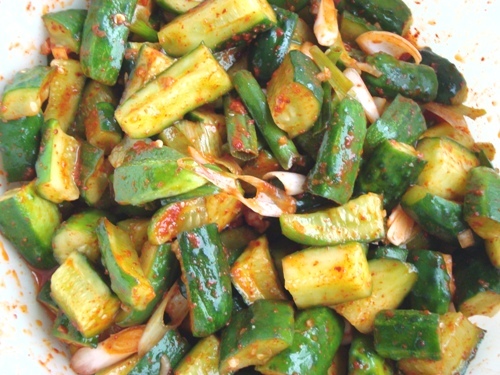 Our garden produced more cucumbers than we could ate this year so I followed this recipe and made kim chi. Everyone loves it. Now instead of too many cucumbers, I felt we don't have enough. Thanks for sharing this great recipe! I followed this kimchi down to the letter and it turned out amazingly. Thank you so much for the recipe and posting the pictures step by step. It really helped! 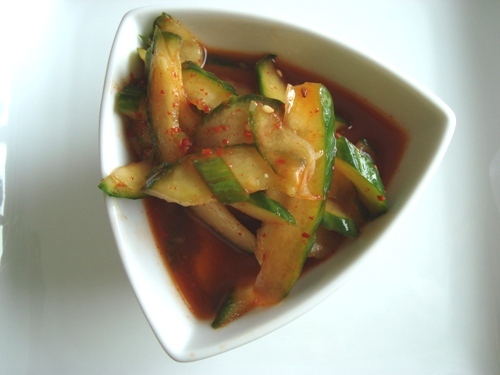 I am a huge cucumber kimchi fan but used to have to go to the Korean restaurant just to get an appetizer portion. Now I make my own... and it tastes even better than the restaurant! Thanks again! I have made this recipe several times. It is one of my favorite side dishes. One of the things I like best about this dish is the crisp, refreshing taste of the cucumbers. But as the recipe says, the cucumbers become soft after a few days. Well, I found an easy trick to keep the cucumbers crisp for weeks. Instead of letting the cucumbers sit in salt to ferment overnight, fill your bowl with cold water (still add the salt) until all the cucumbers are submerged. Then place them into the refrigerator overnight or a few hours. Then drain them and continue on with the rest of the recipe. Hope you enjoy! Just tried this recipe for the first time with about 10 kirby cucumbers. I couldn't find the Korean spices so I got some red pepper flakes from a Chinese grocery store. Here's my conclusion: very good and tasty. BUT, even though I cut the brine in half, it turned out to be too salty for our taste. I think that I might brine as described but rinse the cucumbers and replace the brine with water afterwards, much like is done with the Kim Chi recipe. This yielded about 1.5 1 quart mason jars (much less after a day once everything settles and shrinks down as it renders water). It's also quite different from the ones I had at the Korean restaurant that weren't spicy and were actually quite sweeter. But I think I like these better actually. Other than that it was a great condiment to eat on a cold Winter's night with a zaru soba soup with spicy chicken! Can't wait to try this, I'm going to add Alum for crunch!! This recipie is awesome! Thank you for sharing. I have made this many times. My Korean friend says it was as good as his grandmothers'. You don't get better compliments than that no mater what your background is!!! This recipe is awsome. Could not find chilli flakes where I live but found dried cayane peppers and put in my food processor till flakes. Could you not put the jars in a canner and process so could seal and keep like people do pickles? You may want to add to recipe that you should thoroughly rinse cucumbers in cold water after overnight salt soak or the kim chi will be way too salty to consume. Like your recipe. Easy to follow. I have surplus cucumbers in my garden. I love this recipe. I think it gets better with time!! The cucumbers taste like pickles, only spicy!! Love it!